Home Rocky Roy C. Marsh Jr.
Rocky Roy C. Marsh Jr. 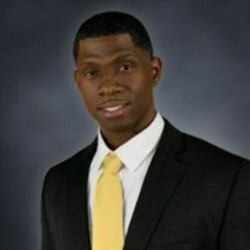 Native of Mobile, Alabama, U.S. Army Air Traffic Controller, Afghanistan Veteran, Human Resources Manager, Toastmaster Director, and proud Trident alumnus. I began my education mostly to prepare myself for retirement from active duty. Throughout my military career, I have always believed training and education to be a key pillar to strengthening human capital; so I completed my Bachelor of Science in Human Resource Management degree. I enjoyed the flexibility and convenience of Trident’s student platform, I immediately re-enrolled and completed my Master of Arts in Education: Educational Leadership and Administration degree. After my commencement in July 2014, I turned my focus to my own preparation for retirement from active duty. The process involved countless hours of seminars, and professional networking. As a member of Toastmasters International, I often spoke on the importance of career preparation and education. In interacting with other HR professionals, we also echo the importance of educating ourselves, employees, students, and managers. Almost exactly a year from graduation, I now return to Trident to pursue the next level. I have gained an appreciation for educational counseling and its delivery. Knowing where I want my life and career to go, I feel confident what is needed. In July, 2015, I begin my doctoral journey to obtain a Doctor of Education in Educational Leadership (Ed.D.) degree.